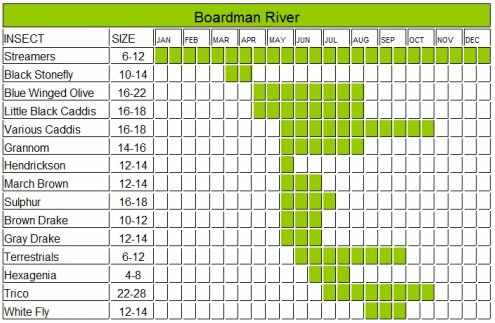 The Boardman River may be the finest wild trout stream in the state, and has a long history of great trout fly fishing. The Boardman starts near Kalkaska and flows into the Grand Traverse Bay near Traverse City. The river is not very wide which is great for wading but a drift boat is not a great option. There are two forks, the North and South that form this river. Both of these forks have good fly fishing, just like the main part of the stream. The area these two come together is called the forks. The closer you get to Sabin Dam the wider and deeper the river becomes, with faster water and great pools that hold larger fish. You will continue to find mostly trout in the stretch from the forks to Sabin Dam. Below Sabin Dam is where you will find the Steelhead and Salmon that run this river. The Brown trout and Brook trout provide great fishing throughout the year, but it is especially good during the fall. 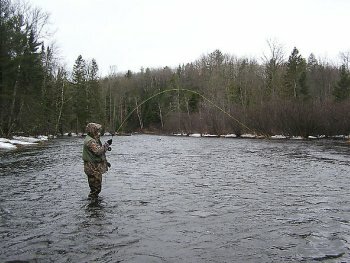 The river has a great variety of species like; Rock Bass, Pike, runs of Steelhead and Salmon, in addition to the wild trout that call this river home. The nice thing about fishing this river is you can usually find one of these species to be active. The biggest problem with this rive is access. There are access points in the upper section but limited access on the remainder of the river. On the upper section you can access these narrow stretches along Brown Bridge Road near where the two forks meet. There is not a lot of fishing pressure on this river because of the limited access. The Adams fly pattern was born on this stream over one hundred years ago, and I assume it still works great since this pattern is one of the most popular dry flies in the world. Leave the Boardman River and return to the Michigan home page.